Q: What can you say about the performance of our girls? A: Our girls are trying hard. They compete with each other, and this is very important. World champion Yana Kudryavtseva did not prepare well for this competition, and took third place in the all-around. And Rita Mamun, who did not make it to be the World Champion, prepared adequately and won by a large margin. We saw Maria Titova – a beautiful girl, who has no equal in the world – not only in gymnastics, but also in term of beauty. I believe this beautiful girl is number one in the world. Her current data and routines meet international standards. Masha won in ribbon, a very difficult apparatus. I found her the classical music from the ballet, and she just stuck with it. Previously, she used the music ‘Katyusha’ for the ribbon routine and it did not turn out nicely because it is a piece of very catchy music, and she is like an aristocrat. But Yana Kudryavtseva brilliantly uses this music for her clubs. That’s how we shuffle music and see who performs better with it. Q: Are there new trends in this season? A: The girls take risk, and perform very impressively. I liked the girl from Croatia very much, who is very expressive. We also have greatly trained gymnasts from other countries. For example, Song Yong Jae of Korea, a clever and beautiful girl. Two Japanese girls, too. These girls are with outstanding quality I think, if I could take them in, they would have won alongside the Russians. That’s why they are being trained by our other trainers. At the very least, they reached the final and brilliantly performed. 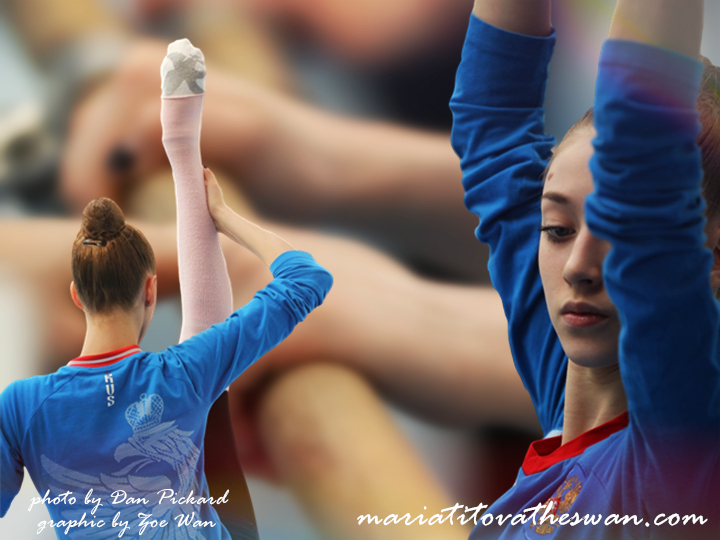 It means, awesome girls with flexibility and stretching, talent are found not only in Russia. Q: After the World Championships you had changed the lineup of the group. A: It was a necessary step. The girls who came out beautifully today are award winners and are already Olympic champions, but unfortunately star fever occurred in some places which caused concerns. And it did not corrode all of them completely. I just changed the lineup. The girls agreed with me. We are now in a wonderful relationship, and we are friends, and they came and cheered for us. That lineup who performed in this tournament, in my opinion, has not even got 30 percent ready. The routines are complicated which require maximum attention and assume no group exercise but individual program without any regard for their partner. They should throw at no place and catch from nowhere. We will keep working. Q: Maybe the Olympic champions had a season of post-Olympic syndrome. Were they simply tired? A: The Russian gymnasts should not be with any symptoms. With the conditions provided by the country for us, we should be always in shape without any syndromes. Q: Last year, Rita Mamun had a very eye-catching routine under the composition “Echoes of Love” performed by Anna Herman. Is there a similar gem for this year? A: Of course there is. Today Mamun still has the gem as she performs a routine under the music ‘Giselle’. It is about a prince coming to his beloved Giselle at a cemetery. It is very complicated because she performs the type of emotion that is impossible on earth. Today Rita did everything technically, except in the final. However, emotionally she did not do all. Maybe she was tired and ran out of stream. She was not fluent in this routine, and that’s why Masha Titova won with the 10-year-old Russian classical music. But classic does not grow old, it was her music, and she greatly performed this Russian dance. Q: Mamun selects very mature musical compositions. A: Well, why not? She uses the Azerbaijani music ‘Trali-vali’ for clubs. She uses different styles everywhere, which is fine. Q: Can we say that Mamun is the current team leader? A: Today, yes. Our team leadership is changeable. Today the leader is Rita, and the day after is someone else. For us, it is a joy. Now we have three leaders – Kudryavtseva, Mamun and Titova. Titova is also standing at the front. She is an incredible beauty. Maybe I will give her to Paris. She will work as a fashion model and become a millionaire. But I’ll receive 10 percent (laughs). Q: Are you waiting for the double Olympic champion Evgenia Kanaeva to return after giving birth? A: I am waiting for her not as a gymnast, but as the vice-president of the Federation of Rhythmic Gymnastics, so that she could help me. Because she is a smart, good, and competent girl. May God grant that she will successfully give birth, and that she will be all fine. I love her very dearly. Q: Who will be there for the next stage of the Grand Prix, which will take place next week in France? A: Kudryavtseva, Titova and Mamun and the same group lineup. Titova and Mamun at this stage have earned the opportunity to be there, and Kudryavtseva – as the world champion – can without doubt take part in any competitions. Q: And where is Daria Svatkovskaya? A: It is a pity that she had an injury. Now Dasha is going through treatment. I am counting on her, and she can also make it in any competitions. She has elegant routines. Q: Won’t she be able to participate in Grand Prix series? A: She still can. Might happen we don’t send anyone but her. Maybe this moment would come. Once she is healthy, we will resolve this issue. Q: Do you feel regret that rhythmic gymnastics missed Yulia Lipnitskaya who in Sochi became the Olympic champion in figure skating? A: I am happy that this brilliant, beautiful, smart, nice girl took elements of rhythmic gymnastics. And the International Gymnastics Federation should be ashamed that its representatives say such elements are harmful to health. Already in ballet there is twist ring, and in figure skating there is twist on 800 rotations in these rings, and we consider them as harmful to health. Of course, we need to revise the routines to remove the boundary. In other sports it is not an issue. We cut the head and tighten the tail, and have got a dullness. But we have tried every possible way to escape from this dullness, and at the moment we have been able to achieve it. Thanks for the translation. Yes you can tell that she really is a huge fan of Maria. I guess others can see that too, hope it doesn’t cause problems. However, she praises everyone so I doubt it.